I'm a fairly major fangirl of Game of Thrones, both the book series and the TV show. However, thanks to our friend the Internet, I've recently become aware that some of my fellow fans are, well, jerks. Mega jerks. Mean girl jerks. We're talking Joffrey-level jerkdom here. For example, if any of them are reading this post right now, they're already rolling their eyes and condescendingly dismissing me as a johnny-come-lately to the series. Any guesses as to why? 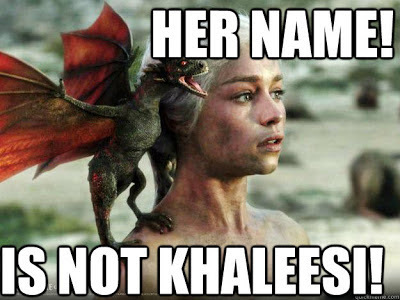 Well, obviously, it's because the television show is called Game of Thrones. The book series is known as A Song of Ice and Fire. 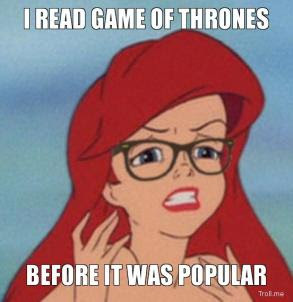 And if you only watch the show and don't read the books, you wouldn't know that, which would lead you to use the terms interchangeably, which would make you not a true fan, according to these arbiters of ASoIaF-landia, who have embraced the hipster notion of that loving it before it was popular is what makes you a True Fan. So certain book readers sneer that show watchers are too lazy to read the books, and even if they do read the books it's just because they liked the show and they'll never be as true and pure a fan as those who picked the first one up in 1996 without HBO telling them to do it, so nyah nyah nyah. I ... I just don't get the hate. A book series that you love so stinking much that you've changed your Facebook profile picture to an image of one of the characters has been made into a pretty fantastic TV show that's hugely popular with readers and non-readers alike, and now you boo-hoo because people like it even though they haven't read the books? People, this tent is big enough for all of us! Folks are passionate about a show with characters you've loved for years. Hooray! Don't start sniffing about who's a true fan and who deserves to have an opinion or join in the conversation. Let us all celebrate the awesome that is this George R.R. Martin-created universe! So the problem isn't everybody. It's that small, vocal segment of the book fans. And I think I know one reason: A commenter on the aforementioned Facebook page posted about hating how the kids who made fun of his reading material in high school are now jumping on the Westerosi band wagon. Valid nasty high school feelings, perhaps, but come on, man. Fans are fans. I like what you like, and they like what we like. We may like it in a different way or for different reasons, but let's let people like what they like, any way they like. So am I being too harsh; do the book readers have a point? Or is a fan a fan, regardless of pedigree? Bah, this happens with everything. "I listened to CAKE *before* it was on Mission Hill," Etc. Anyway, it’s the same reason so many people got so wrapped up in Harry Potter—everywhere you go, there was someone that has the same interest(s) as you. Especially when your interests are pretty niche, I think that’s a great feeling.